When your garage door opens, the springs are the components that provide the lifting power to raise your heavy panels off the ground. While the door is closed the springs contract, meanwhile storing a huge amount of energy as they wait to be released. If a spring breaks or deforms, that energy has to go somewhere, and the results can be dangerous. 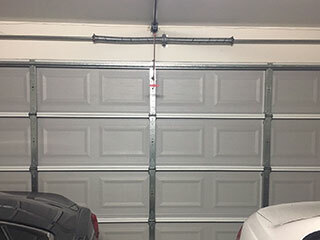 In most garage setups, the springs will be arranged either along the top of the door, or pointing across your garage ceiling perpendicular to the door. The springs above the door work by torsion, coiling and uncoiling around a supporting bar. The ones pointing away from the door are simpler, come in pairs and store their energy by being compressed then released by stretching out again. In the course of their working, springs are placed under immense stress and pressure, which causes them to be weakened over time. If a spring becomes twisted, frayed, or bent, this will increase the amount of stress that's placed on other parts of the system, potentially causing those to become worn faster too. If a spring breaks or snaps out of place, your garage door won’t be able to open. Garage door springs can be dangerous to work with. If a spring breaks or comes free while even partially compressed or coiled, it can go flying across the garage, or even into the street outside if the door is open at the time. Our professional technicians will carefully release the tension and make sure the mechanism is safe to handle before unhooking the springs and repairing or replacing them. A fresh coat of lubricant will help keep them intact for a long time into the future. Our team can make house calls anywhere within Studio City, and are available on weekends and weekdays alike. The longer you live with faulty springs, the more likely it is that worse damage will occur in the future. Call us today.